For most boat owners, the last thing that you want to have to deal with is taking your boat in to get repaired after a collision. Not only does this mean that you have to be without your boat for a period of time, but you’ve also got to find the best boat collision repair specialists to handle your needs. Well, if you live near Minnetonka, MN area, you’re in luck because our team at Anchor Marine Repair is the #1 marine collision repair facility around. 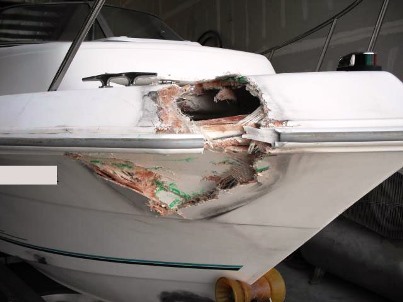 Don’t be embarrassed that your boat was involved in a collision. At Anchor Marine Repair, we’re not concerned about what happened with your collision. Instead, our primary focus is around how to provide you with the best marine collision repair services possible. The more time you spend out on the water, the more likely a collision will occur, so there’s no need to be ashamed about your situation. Trust us when we say, we’ve been there before! So, if you’re looking for a trusted collision repair that comes with no questions asked, Anchor Marine Repair is the perfect partner for you. Not many marine collision repair companies can say that all of their technicians have been with them for more than 10 years. Anchor Marine Repair, on the other hand, can proudly say this! This stability along with more than 45 years of combined experience allows our collision repair specialists to get your repairs done right the first time around. Combine this with our pick-up and delivery services within 250 miles of the Minneapolis/St. Paul area and that encompasses the Anchor Marine way. Our customers come first at all times, and so do your boats! Dealing with a boat collision is stressful enough. Rather than stressing out additionally about the collision repair shop that you choose, go with Anchor Marine Repair, the best marine collision repair shop in the Minnetonka, MN area. Give us a call today at (763) 972-3540 or email service@anchormarinerepair.com to learn more about our top notch collision repair services.